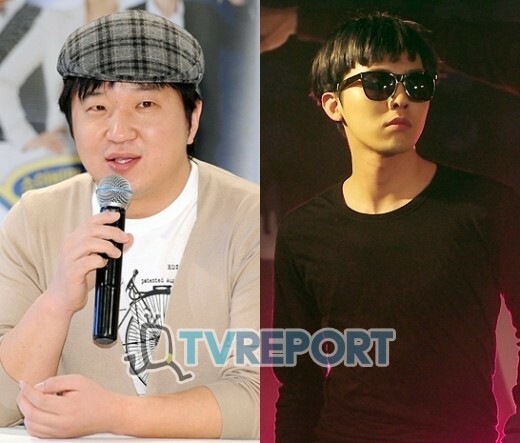 Jung Hyung Don tried to call G-Dragon to end the 'fashion debate' which started ever since the airing of 'Infinity Challenge'. Today on MBC's 'Everyone Weekly Idol'. the ranking of the idol fashionistas who are posing threats to Jung Hyung Don was released. The best 7 'terrorists' (since Jung thinks they are threatening his 'fashionista' position) and the worst 3 were disclosed. When Jung Hyung Don revealed the ranking , he said, 'GD,G-Dragon, Jiyong, Kwon Ji Yong, Big Bang' Therefore, we can see he regards Big Bang's G-Dragon as his biggest rival in the field of fashion. He elaborated, 'now I have to end this debate with G-Dragon' He also said he had tried phoning G-Dragon about this. The netizens commented, 'I really wonder how G-Dragon manages to bring out such images' and 'I have voted for Jung Hyung Dong. G-Dragon, have you seen this?' etc. Besides G-Dragon,in the same programme, the comedian was also calling 2PM's Jun Ho, Beast's Doo Jun together with Lizzy and Jung Ah of After School. “Since G-Dragon has already stated that he would not accept any birthday gifts, we are instead going to increase our donation efforts and raise awareness for the needy children, as we believe that’s what G-Dragon meant to say,” the fan site added. What do G-Dragon and Moon Geun Young have in common? 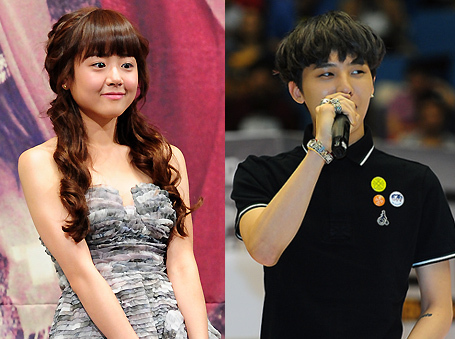 Do you know what Big Bang’s G-dragon and Moon Geun Young, a Korean actor, have in common? Both of them once severely suffered from hostile remarks and antagonistic fans, but they wisely overcame the negative responses toward them by discouraging themselves from overreacting to them. The hostile remarks and rumors toward GD and Moon all started for trivial reasons as did for Tablo. The tongues and fingers of an unidentified antagonistic group of people toward such celebrities are strong enough to totally devastate certain famous figures’ lives. GD and Moon, however, adopted a different strategy: holding their lips tight and only going about their own business. With such a strategy, Moon succeeded in changing her image by proving herself to be a good actor in various drama series and films, while G-Dragon as well showed signs of a rare genius in music by producing a series of his hit songs. Moved by his fans who donated 20 million won to charity in his name, G-Dragon has also donated a large amount of money in celebration of his birthday. It was G-Dragon's 24th birthday on 18th and on that day, it was reported that his fans donated 2 million won to Seoul National University Children's Hospital. According to YGE, after learning this, G-Dragon wanted to donate money himself too. He has donated 50 million won in total. 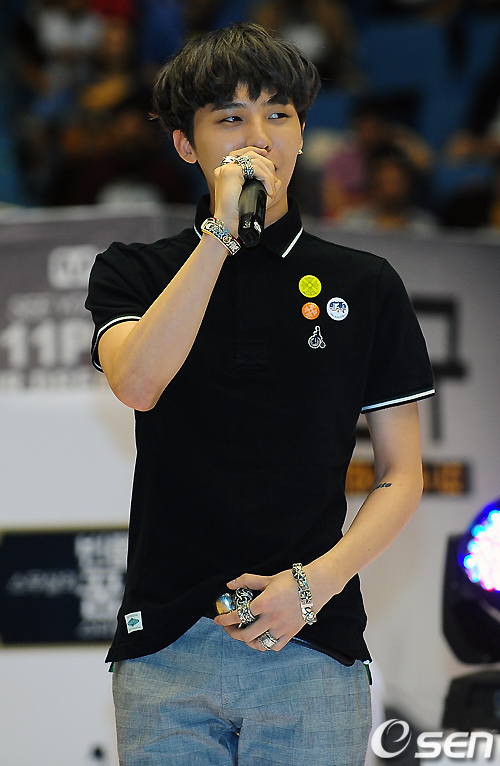 G-Dragon told his fans previously that he won't be accepting their birthday gifts this year. He said he made this decision because he does not want to burden the fans, who always prepare carefully-selected presents for him every year. 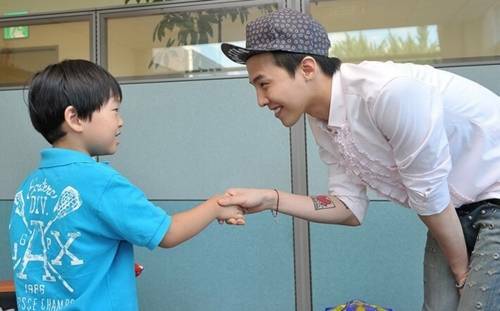 G-Dragon's warm care has inspired the fans to step forward in order to help others. Instead of buying him gifts, they collected 20 million won and donated it to the Children's Hospital, which has drawn public attention. According to him, "It was nice to see the fans thinking about the people around us and their donations mean a lot to me." He also expressed that he is willing to do voluntary work. What he did has lay a milestone in idols fandoms. G-Dragon further elaborated, "It was completely unexpected. I am really impressed by what the fans have done. I am already thankful for the support they give us each time. They have good hearts for being aware how many difficulties others are going through. Because of this, I would also like to donate 50 million won for Seoul National University Children's Hospital. This birthday is very likely the most memorable one that I have ever had." In fact, G-Dragon has already taken part in YGE's "WITH" campaign and has been donating annually. The campaign started in 2009. It is an official campaign in which YGE donates part of the revenues received from their artists's performances and selling of merchandises. G-Dragon said, "In the meantime, we are very busy on working on our music and it is difficult for us to have a lot of contact with the fans so I want to take this chance to do more positive things to the society." Moreover, the 5th debut anniversary of Big Bang is on the next day (19th) so this carries a greater meaning. Team GG “Having An Affair” #17 on Billboard.com! Team GG “Having An Affair” ranks No.17 on BillBoard charts! Park Myung Soo, "G-Dragon, Let's perform again with Park Bom on this winter"! G-Dragon and Park Myung Soo reunited as Team GG at 2NE1's concert where they performed, "Having An Affair", with Park Bom. Wearing black and white costumes, they delivered an exciting performance for 4000 fans. Together with Park Bom, who was in a mini black dress, their performance hyped up the atmosphere at the concert. Park Myung Soo said, "It has been awhile since I met GD and Park Bom again after our performance for IC. I'm very glad. G-Dragon and I haven't been in touch after the program but it would be good if I can keep the friendship with him. Thanks to G-Dragon again." G-Dragon said, "I have been watching 2NE1 closely ever since we were young and I'm so glad to be invited to their concert. I am just so amazed by their stage that I forget that I have to come out and perform too." Park Myung Soo added, "Now it's summer and when it's winter, I will ask G-Dragon and Bom to perform with me once again." 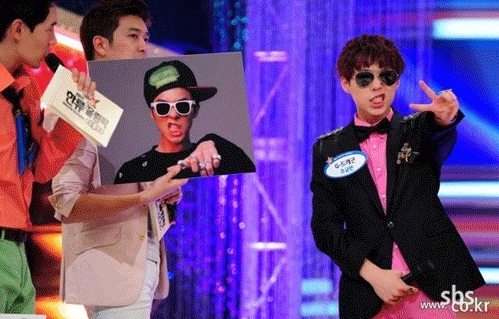 Gagman Kim Goo Ra caught the attention of the audience by sending a warning to the leader of Big Bang, G-Dragon. On the episode of MBC's Sebakwi, aired on 27th, Kim Goo Ra talked about the golden era of Sung Dae Hyun, singer of the rave music group, R.ef, who was active in 1990's. Kim Goo Ra said, "R.ef was really popular during those days." Sung Dae Hyun responded, "That was really a long time ago. Kim Tae Won always say that we were as popular as G-Dragon is today." Kim Goo Ra joked, "There was a day that I thought I was more popular than Michael Jackson too." He added, "G-Dragon, you should be strong. It won't always be like this." A survey conducted by cable channel Y-Star’s Goonggeumta asked 1,000 citizens in Seoul about who is the best idol group member. 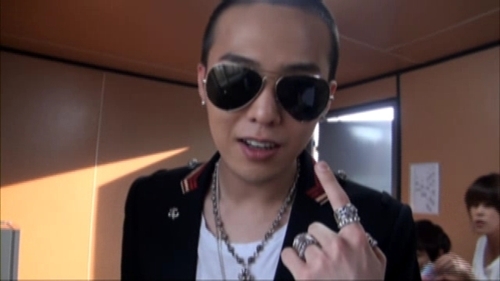 They answered that G-Dragon is the best for being a leader, a song writer, and rapper. 2PM’s Nickhun won a double crown for being the cutest member and being multilingual. The show will air on September 1 at 2:00 PM. G-Dragon voted as Korea’s number 1 idol! G-Dragon was recently voted as Korea’s number one idol. Cable started a poll that asked 1,000 Seoul citizens “Who do you think is Korea’s number one idol?” Results showed that G-Dragon was picked due to his truly admirable talent in his part as Big Bang‘s leader, songwriter, producer, composer, and rapper. Fans don’t have to wait any longer for G-Dragon‘s solo comeback, as Big Bang‘s G-Dragon is set to return with his solo on October! Next month, G-Dragon is scheduled to reveal his mini album and start his solo activities on October for the first time in a year and a half. With Daesung‘s car accident, Big Bang members are focusing on their individual activities, starting with G-Dragon’s solo comeback. YG Entertainment has said Big Bang member G-Dragon will make a comeback as a solo but has yet to decide on a date for it. The remark came from an official at the top talent agency who denied reports from earlier in the day which said that G-Dragon would make his comeback to the local music scene with a new album next month. "The reports regarding G-Dragon’s comeback in October are not true," she told 10Asia over the phone on Monday. "It is true that he has been recording several songs but a date for his comeback has not been finalized." She went onto explain that YG artists are always working on their music and a release date of one's album is subject to change depending on its progress. If G-Dragon unveils a new album next month it will be his first solo release since "Shine a Light" which went on sale in March 2010. G-Dragon, whose real name is Kwon Ji-young, is the leader of his five-member boy band Big Bang, who were discovered and trained by YG Entertainment. 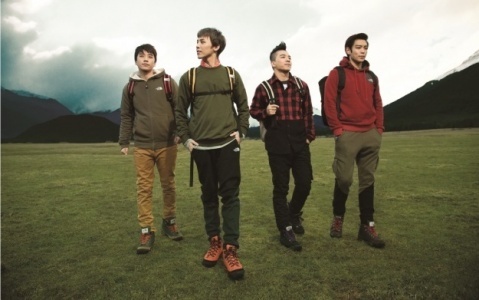 As a group, Big Bang has been taking a break from their music activities and were recently named the new models of clothing brand North Face. 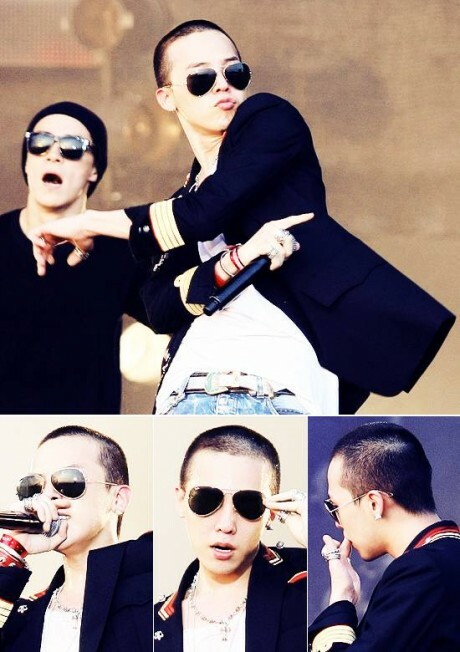 Why did Big Bang’s G-Dragon have his head shaved? According to a reliable source from the music industry, G-Dragon, a leader and producer of Big Bang, has recently concentrated all his energy on creating his new solo album. In fact, GD shows up every day in his own office in the building of YG Entertainment, fully absorbed in producing his new album. The album is scheduled to be released around in October and November, but the precise date is not yet fixed. Considering that he himself writes songs and lyrics, the date can be delayed. YG Entertainment has kept their mouth closed about the details of GD’s new album, but president Yang Hyun Suk of YG Entertainment is said to make an official announcement regarding the album before long via YG Life, known as the official website of YG Entertainment. Yang Hyun Suk revealed that there were once plans for a Big Bang + Jay Park unit. On SBS‘s ‘One Night of TV Entertainment’ that aired on the 7th, two of the judges from SBS’s ‘KPOP STAR’, YG Entertainment’s Yang Hyun Suk and JYP Entertainment’s J.Y. Park, came together as guests on the show. Yang Hyun Suk astounded the viewers by saying, “This is the first time I’ve revealed this secret, but during the beginning stages of Big Bang, we were thinking about having a separate G-Dragon, Taeyang, and Jay Park unit“. He further explained, “But in the end, separate teams were formed due to their busy schedules, and they weren’t combined“. J.Y. Park also talked about what it was like to engage with Yang Hyun Suk on a program stating, “In addition to liking him as a person, I think that he is a producer who has a good sense for things and is better than me in certain areas, so collaborating with hyung is quite enjoyable for me“. 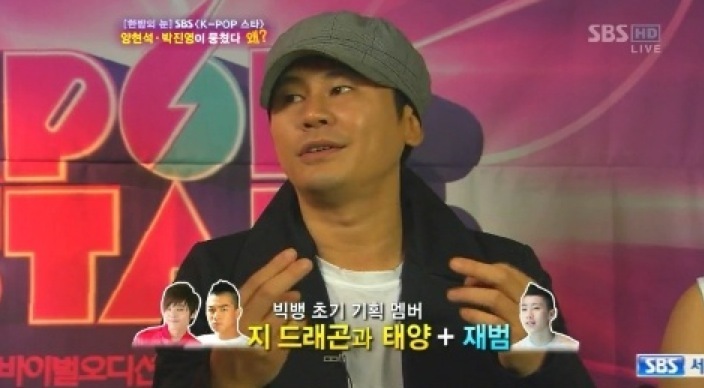 Yang Hyun Suk further explained their close friendship commenting, “I’ve known J.Y. Park well since he was in this teens roaming around Gangnam Station“. Big Bang’s G-Dragon was chosen as the #1 ‘idol that makes a lot of money’. On MBC’s Everyone “Weekly Idol” broadcast on the 10th, the results of a survey titled, “Powerful money force! Rich idols BEST10“, will be revealed. For this study 90 idols that are currently active were directly involved in the survey and were asked to reveal their most honest answers. In this survey, the #1 idol picked was Big Bang’s G-Dragon. A lot of idols said, “G-Dragon has the most royalties (copyright fees)“, MBLAQ’s G.O was cited saying one of the reasons was, “He is the one icon.“, showing praise in his words. 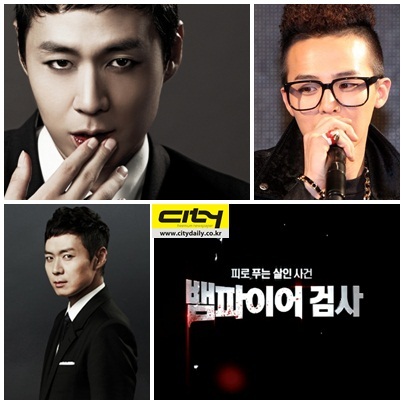 In addition to G-Dragon, BoA, Kara, beast’s Yong Junhyung, SNSD’s Yoona, IU, etc were ranked as well. Lee Yin Hye reveals that G-Dragon had once embraced her! Actress Lee Yin Hye made the surprise confession that G-Dragon had once embraced her. On the broadcast of QTV's "Women's Rankings" on September 8th, the best five undisclosed videos on "My life"s greatest consolations?" were revealed and it was on that topic when Lee Yin Hye revealed her story. G-Dragon has inked his body multiple times in the past, and it looks like the Big Bang leader recently got another tattoo! Fan reports began spreading across the internet after G-Dragon was seen publicly at the 2NE1 concert held a few weeks back. At a children’s hospital charity event last week, attentive VIPs noted the tattoo yet again. The tattoo itself has ignited interest among many, as it features a curious cartoon-like heart with arms and legs running on a path. 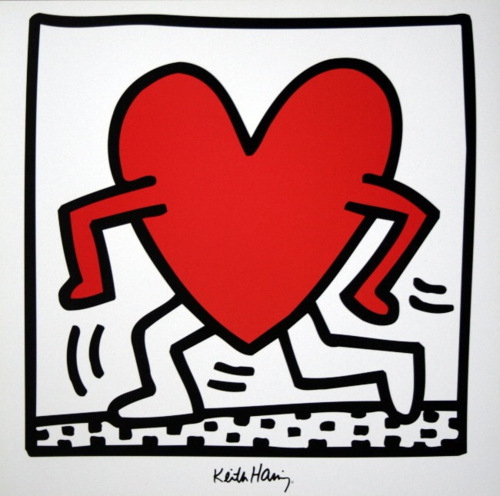 Turns out that this is a famous icon by Keith Haring that is still commonly seen today. An artist and social activist whose work responded to the New York City street culture of the 1980s, Keith made his mark on the 80′s by painting throughout the New York subway system in chalk. It wasn’t until later that his art made its way above ground to become mainstream. His works consisted of public art and pieces of pop art. His bold lines, vivid colors, and active figures carry strong messages of life and unity. Even though the mastermind behind those crazy-odd creatures with three eyes or extra-long necks has passed, we can still remember him through his art, and, now, thanks in part to Jeremy Scott for his collaboration with Adidas, in fashion. Around the months of October and November, the biggest girl groups and hottest ‘icons’ are going to be butting heads, releasing their new albums around the same time for a competitive battle to the top. Big Bang’s G-Dragon will also be unleashing his new album around October. Contestants of ‘Superstar K2’ will be coming out with their new genres and ballads respectively, while scheduling their comeback dates. The rumors and talk about the actual comeback date for Big Bang’s G-Dragon is fluttering around the K-pop industry. That’s how much of an issue his highly anticipated comeback is. Last year in March, G-Dragon announced his first solo promotions, ‘Shine-A-light. Team GG & Park Bom's Look-A-Like Revealed! The actors who look like Park Myung Soo, G-Dragon and Park Bom surprised the studio by their performance in the TV programme. In ' Korean Wave Olympics' which was aired on 13th, the actors who resemble Park Myung Soo, G-Dragon and Park Bom showed up in the programme. 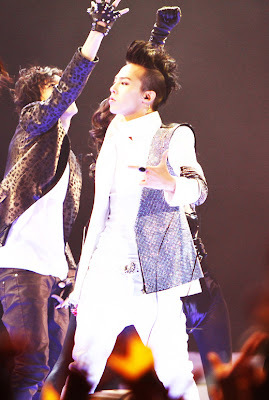 'G-Dragon performed in the opening stage. The actor bore much resemblance with the real G-Dragon. When he was performing, he was able to deliver a powerful stage and brought up the atmosphere. Followed by him was the performance of Park Myung Soo, the face and tooth of the actor look very alike with Park Myung Soo and his performance was well received by the audience. Then, the actor who imitated Park Bom also performed. The actor who looks like G-Dragon joked, ' it is not true that YGE is close to the fans. G-Dragon has not signed for overseas fans especially. 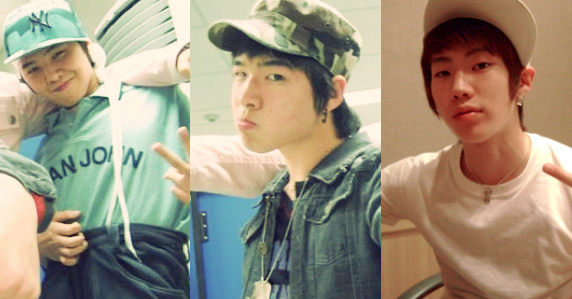 After going to the YG audition, I figured out I look a little bit alike with my boss, Yang Hyun Suk, too. OnStyle‘s ‘Style Magazine‘ recently went behind-the-scenes of G-Dragon‘s fashion photoshoot and interviewed the star on fashion trends and fashionistas. The episode will also delve into why he’s obsessed with accessories, where he normally goes shopping, and fashion styles he’d love to try one day. Check it out on September 17th. The top 3 idols are all leaders of their groups. Other stars on the list included B2ST’s Yong Jun Hyung, Super Junior’s Leeteuk, Infinite’s Sung Yeol and L, MBLAQ’s Seung Ho, FT Island’s Hong Ki, 2AM’s Jo Kwon, and more. Over 1,000 people responded to the survey, which was conducted from August 25 to September 16. Big Bang’s G-Dragon’s airport photo is the latest buzz on the web, but not for the reasons one might expect from a fashionista like GD himself. The photo above was posted on an online community board on the 23rd under the title, “G-Dragon writes his songs even at the airport”. The poster described, “G-Dragon was standing in the baggage claim area wearing a headphone. Then suddenly he took out a piece of paper and started writing something on it. 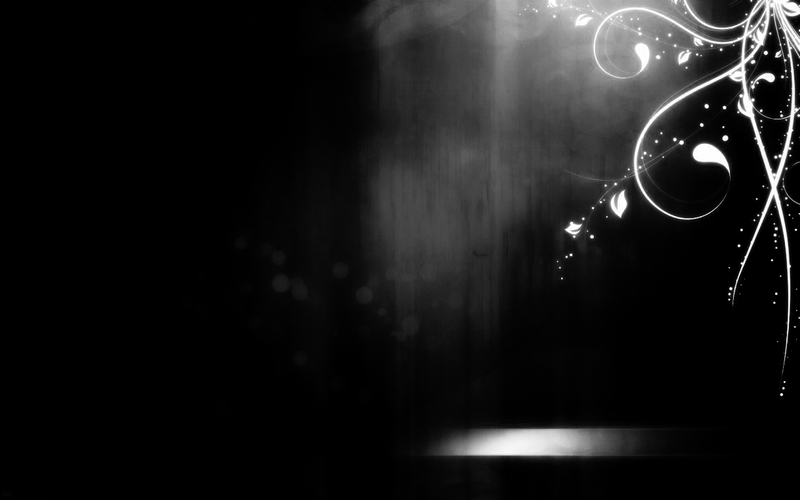 I took a peek at it and I was surprised to see that he as writing music notes”. As you can see in the photo G-Dragon is in a busy airport with many people around him, but when his musical genius kicks in he has to write his songs regardless of the time or place. After seeing the photo the netizens commented, “So this is how managed to write more than 100 songs”, “It’s nice to see him concentrating so hard”, “He looks good even when he’s writing songs”, and so on. Yeon Jeong Hoon: "G-Dragon looks like a vampire"! Actor Yeon Jeong Hoon said Big Bang member, G-Dragon is his 'role model' for acting as a 'vampire' which attracted attention from the public. On 28th, Yeon Jeong Hoon attented the press conference of the new drama of CGV, 'Vampire Prosecutor'. The drama is about one day, Yeon Jeong Hoon has become a vampire and how he tries to use his hidden ability to solve the cases for the Repulic of Korea. The drama will be broadcasted as a 12-part drama on OCN and the first episode will be shown on 2nd of October. G-Dragon will make a comeback, but no specific date for now! After the release of his first solo album “Shine A Light” in March, he worked on Big Bang’s album and various activities with the unit GD&T.O.P. G-Dragon is attracting many fans’ attention with the news of his new solo album. According to an acquaintance of the entertainment industry, G-Dragon’s solo album will be released this month, but nothing is certain. It’s because the singers of YG Entertainment that G-Dragon is in, don’t have an exact date of an album’s release, but rather decide to release whenever the song reaches near perfection. Meanwhile, Big Bang is nominated for 2011 MTV Europe Music Awards – World Wide Act Asia Pacific, which will be held November 6 at Northern Ireland. It has been revealed that Big Bang’s G-Dragon had been investigated by the prosecutors’ office of Korea for allegedly smoking marijuana. Seoul central prosecutors’ office, violent criminal division’s chief prosecutor has stated, “We decided to rule suspension of indictment on behalf of G-Dragon for him breaking the drug law.” According to the prosecutors’ office G-Dragon has smoked marijuana in Japan back in May and he was tested positive for a drug test done in July. “G-Dragon was given a cigarette in a club in Japan from an individual who he didn’t even know the name. He said it smelled different from the regular cigarettes and he suspected it of being marijuana, but that he did smoke a little anyway. By receiving a suspension of indictment the crimes go under your records, but for considerations of age, the severity of crime, and behavior after the fact, you do not get prosecuted. YG Entertainment is in a state of emergency because of the mishaps that have been occurring lately, that started with Daesung’s unfortunate accident and now G-Dragon and his suspension of indictment for smoking marijuana. Originally, GD&TOP were going to officially debut in Japan with the single “Oh Yeah (Feat. BOM)” on November 9. Currently Big Bang’s other member Daesung is also going through some “self-reflection time” because of the car accident that resulted in another man’s death. Although he was acquitted, it is being said that he will not return within this year. YG Entertainment has another major problem, stocks. In June YG Entertainment went through the initial phase for being listed on KOSDAQ, but they are still not listed. Experts are stating that the recent string of incidents will probably not stop YG Entertainment from being listed. However, YG Entertainment relies on its celebrities and their activities. Thus, all of these accidents that are occurring will probably have a negative impact on YG Entertainment stocks if they do become listed. YG Entertainment has just released an official statement about their position regarding the issues surrounding G-Dragon‘s marijuana case. We would like to sincerely offer our deepest apologies to all the fans and to everyone who appreciates Big Bang’s music. G-Dragon underwent an investigation for smoking marijuana last July. Because G-Dragon had never smoked marijuana, we cooperated with the investigation confidently and proceeded as usual with scheduled events. However, according to the hair strand test, G-Dragon tested positive for minuscule amounts of marijuana, which shocked us. While we were contemplating what the reason could be, we thought of the event that occurred in May during their Japan tour. There was a drinking event to celebrate a successful concert with various Japanese associates who visited us at the concert location. When G-Dragon went to use the restroom, a young person who seemed to be a Japanese fan recognized G-Dragon and offered him a cigarette as he greeted him. Out of courtesy, G-Dragon took two or three puffs, but upon feeling that it was different from normal cigarettes, he flushed it down the toilet right away. We thought it to be a trivial event, and soon we were unable to remember that it ever happened. However, when we began to ponder over the reason for this positive test, that night’s event returned as the likely cause. We contacted the prosecution right away and related the event exactly as it happened. Although there was no legal penalty issued, the guilty conscience and responsibility for causing everyone pain is a weight that G-Dragon and the company must now carry upon our shoulders, and it is heavier than any penalty. As celebrities who have received a lot of interest from the public, and as a company who is supposed to thoroughly manage them, we sincerely regret the emergence of this situation, and have been self-reflecting on our carelessness. We deeply bow our heads as we apologize for causing you to worry once again, and we will try our best to make sure this type of event does not occur again. - Shaving his head had nothing to do with this issue. The test was middle of June. He shaved his head 2 months later. The case was already over then. I didn't even know that he shaved his hair. There's no connection at all. - We didn't let the public know so soon because he's a celebrity and this is just a small case. We knew that he didn't do it consistently because only his hair was tested positive, not his urine. *An indictment is a formal charge of accusation of a crime. To suspend that crime means there will no longer be charges held against him. Big Bang‘s G-Dragon made headlines recently after it was revealed he tested positive for marijuana usage. Considering how his peers in the industry were blacklisted for scandals, netizens have been wondering whether he too will be banned from appearing on the nation’s biggest public broadcasting channels, KBS, MBC, and SBS. SBS also came out with similar announcements to KBS and MBC, stating that chances of restricting G-Dragon’s TV appearance would be low. Normally, an official decision for a celebrity’s removal from a broadcast appearance is normally made after each of the broadcasting stations hold a meeting with the Performers’ Regulation Commission. Currently, a total of 12 celebrities have been blacklisted by MBC and KBS after being hit with drug-related charges. Some of these include Oh Kwang Rok, Yoon Sul Hee, Jun In Kwon, Ju Ji Hoon, and Crown J. Chief prosecutor speaks about G-Dragon's Marijuana case! After 'G-Dragon‘s marijuana investigation came to light', many netizens immediately commented on how the idol must’ve shaved off his hair to avoid getting caught. The investigation required both a urine and hair sample. To refute these accusations, a chief prosecutor of the Seoul Central District Prosecutors’ Office named Kim Hwe Jong stepped forward to say, “G-Dragon and the shaving of his head during the marijuana investigation have no relation to one another“. G-Dragon did not receive a suspension or indictment for his charges. Many netizens expressed whether this was too light a judgment, considering his offense. And why was this revealed so late? At this time, all activities for G-Dragon have been temporarily suspended. YG Entertainment has issued an official apology, and the national broadcasting networks of 'KBS, SBS, & MBC have all declared that G-Dragon will not be blacklisted from any appearances'. Although the Korean media reported yesterday that Big Bang had canceled a scheduled photoshoot for a North Face advertisement in light of recent events, it was revealed that G-Dragon and the Big Bang members had attended the photoshoot as planned on October 5th. It’s also been reported that the many brands Big Bang is currently endorsing have not yet approached YG Entertainment with any issues. Why was G-Dragon singled out? Big Bang’s G-Dragon received a suspension of indictment recently for smoking marijuana. As ripples of the events are shocking the fans, some are starting to wonder why out of all the members in Big Bang, only G-Dragon was investigated for the charges. According to the prosecution, G-Dragon smoked marijuana while in Japan in mid-May. YG Entertainment, G-Dragon’s management company, also officially issued a statement of admission and apology, “While on tour in Japan in May, they were out drinking with the event coordinators in Japan and when G-Dragon went to the restroom, someone who appeared to be a fan gave him what he thought was a cigarette. He inhaled a couple of times but felt different from a cigarette so he remembers throwing it out in the toilette”. It is believed that G-Dragon’s contact with marijuana occurred during Big Bang’s tour in Japan from May 10th through the 19th in Osaka, Chiba, and Nagoya. 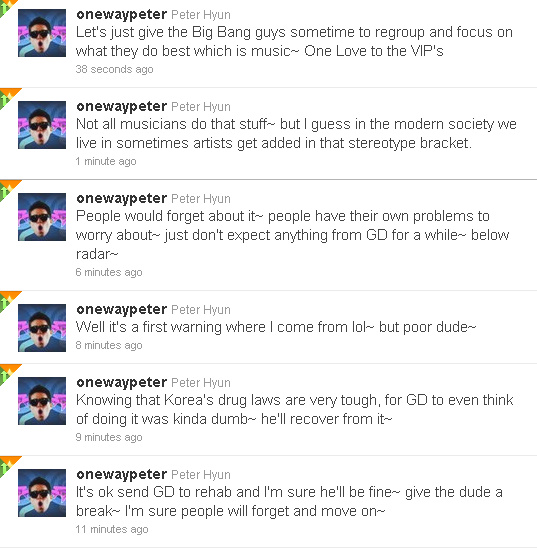 Some are starting to wonder then why G-Dragon was singled out. If Big Bang was on tour together during that time, Why was G-Dragon the only one subjected to the urine and hair testing for drugs? The prosecutor’s office simply stated, “There was only information regarding G-Dragon. There was no mention of other members, therefore only G-Dragon was investigated”. The fans wonder yet, because once drug-related stories break out they tend to continue with others given past history. Entertainment industry insiders are worried that G-Dragon’s investigation will be followed by others in a string. The prosecutor’s office verified, “There are no other active investigations ongoing at this time other than G-Dragon”. For now. G-Dragon is suggesting a new standard in the Korean pop music industry. His thoughts on fashion, music, musicians and K-wave. His thoughts are bigger and broader than expected. The era of dance artists and idol groups started in the 1990s. Despite its short history, the people who changed the trend of their time will always be there. People like Seo Taiji & Boys, Deuce, and H.O.T set some standards through their music and dance before. Isn’t G-Dragon someone who can succeed this kind of legacy? This enfant terrible, who is the leader of Big Bang and also a solo musician himself, is only 24 years old. Of course, his beginning was not too different from other idol stars. 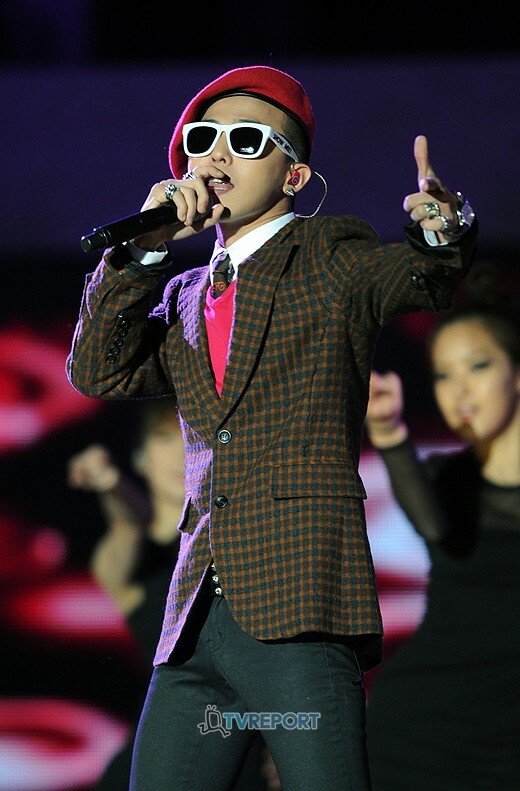 Being selected at an early age, he was raised as a star going through the stage of a so-called “trainee.” However, G-Dragon did not simply constrain himself with singing and dancing, he is now working as an idea bank and a producer who controls fashion, attitude, choreography, stage design, album art work, not to mention the music composing. This is why we cannot just call him and Big Bang a mere idol group. However, these days, G-Dragon is mentioned more as a fashion icon than as a musician. Some even parody his bold and adventurous fashion style. We should acknowledge that G-Dragon has a part in the popularity of Jung Hyung-don, who insists the "no mercy" fashion sense to be his unique style and challenges GD, or the web-based cartoon “Fashion King,” that constantly mocks fashion. He, who is passionate not only about music but also about fashion, is now planning a new project. Aside from fashion, what he is really plugged into these days is his second solo album. His first solo album, Heartbreaker is indeed an album that showed the essence of G-Dragon. From beginning to end, from outside to inside, we could feel that he poured all his energy to make it as “his album” wholeheartedly. That is probably when we started seeing G-Dragon as a producer and a musician, not just an idol singer. Also, his solo album will be hip-hop based, which is his musical root. It will be different from his previous one that was more of a mixture of various genres and styles. This is why he's working on his solo album in a slow pace. He wants to produce good music and to be a standard, and because he wants to pull Korean popular music a step higher, he has lots of thoughts and worries. Nobody asked or forced him to do it, but why is he carrying this enormous and heavy responsibility on his shoulder? An enthusiastic cheer-up for GD, who is stepping forward one by one each time with the heavy load. NOTE: This interview was done BEFORE the marijuana issue broke out.